All manner of ponds will benefit from increased oxygenation, with it being particularly necessary for heavy stocked fish ponds. All animals on Earth, with the exception of loriciferans, require oxygen to survive, and your fish and overall pond ecosystem are no different. In fact, most fish species need at least 6 parts per million (ppm), or 6%, dissolved oxygen to support their day to day activities. Levels below this are stressful for fish, and can result in unusual behavior; some fish may become lethargic and lose their appetite, others may zip about seemingly madly in search of healthier water, and many will frequently come to the water’s surface to breath actual air (thus increasing their chances of being predated upon by herons, raccoons, and the like). If dissolved oxygen levels fall below 3 ppm, most fish will begin to suffocate – below 2 ppm and they die. In addition, anoxic, or low oxygen, waters cause significant stress for fish and thus increase the likelihood of them succumbing to illness and disease. For example, lack of oxygen impedes the nitrification of ammonia (and in fact hinders the entire nitrogen cycle in general), and thus leads to deadly ammonia toxicity and painful ammonia burns on your fish. Water that lacks sufficient oxygen is likely to have little to no water flow; stagnant, anoxic water is prime habitat for all manner of algae and can result in algal blooms and deadly eutrophication. While algae and other microorganisms are natural and often helpful (as mentioned in our articles on algae, bacteria, and other aquatic microorganisms), if allowed to grow out of control they often become quite harmful. To avoid the above issues, there are a variety of techniques that you can use to easily and efficiently increase the dissolved oxygen in your pond. Within each of these methods, we will include general details, how they work, and some of their pros and cons so you can gauge which may be most suitable for your pond. First and foremost, when choosing this option you’ll need to be sure that you get an aquatic air compressor, as standard ones are only suited for use on land. This option also requires an electrical connection, and typically work by pumping air from a surface compressor unit through a tube to an underwater diffusion plate at the bottom of the pond where the bubbles then rise up through the water and add oxygen. These are typically quite powerful depending on the size and model, and can result in the elimination of water stratification. This can be either a pro or a con depending on how you look at it – no stratification means an even temperature throughout the pond, but this may not be good during particularly hot periods when fish need a cooler spot to hang out in, but it also means more water movement and therefore reduced likelihood of algae overgrowth. Aquatic electrical air compressors typically cost anywhere from just shy of $100 to well over $1,000, depending on the size and model that you choose. You’ll need to keep this initial cost in mind, in addition to several dollars a day in electrical costs plus any needed maintenance costs over the years. However, for a heavy stocked fish pond or large lake, a powerful air compressor really can’t be beat for it’s massive aeration and oxygenation potential. An eco-friendly option, solar air pumps or fountains rely on the sun to power a battery that can then fuel a pump that works by pumping air to the bottom of the pond and thus creating bubbles as the air rises to the top of the pond. There are options available for both small ponds (only a couple hundred gallons) as well as large ponds (several acres in size). This option comes with some challenges, of course – without adequate sunlight, obviously the pump won’t work. However, better quality products are able to hold power and continue running for several days without sunlight. Regardless, these aren’t recommended for particularly cloudy locations. Another thing to keep in mind is the price of replacing batteries, but there are also a few battery-free direct solar options. These tend to be more expensive upfront than their battery-clad counterparts, but cheaper overall in the long run, though most solar powered units are still several thousand dollars. A classic and aesthetically pleasing option, incorporating fountains and waterfalls are a great way to more naturally incorporate oxygen into your pond as the water falls and traps air within water droplets that then tumble into the pond. However, these are more suitable for ponds that are only a few feet deep – ponds that are 6 or more feet in depth will only receive oxygen from fountains in particular within the first few feet of water as they only draw water from the very surface of the water. Waterfalls will also help to circulate water some, so they do a bit of a better job than fountains by increasing water movement and therefore moving oxygen through more of the pond. However, only having a waterfall or fountain will not be able to provide enough oxygen for your pond unless the water is fairly shallow. If you have fish in your pond and you notice them coming to the surface of the pond frequently, this likely means that they’re not getting enough oxygen from the water. Suitable for ponds that are in more rural areas without easy electrical access, wind-powered aerators are still commonly used but may not be the most reliable. They work by, as you might expect, utilizing wind via a small windmill to power the air compressor/pump (or a variety of other pond implements! ), making them a very environmentally friendly option. The air is delivered to you pond through a weighted airline (so that it sinks rather than floats), just as with the other aerators in this list. The initial cost of a windmill is typically around $1,000-2,000 and can save you anywhere from $20 to $60 per month in electric costs – so the benefits from savings are long term ones. These work best in open areas where there is more air flow, and even better if they’re placed on a hill to increase their access to wind. When purchasing an air-powered aerator, you’ll need to ensure that you choose a model that will be able to provide an adequate amount of CFM (cubic feet per minute), which is the amount of air that can be moved to an air compressor in your pond. Generally speaking, ponds that are only a few thousand gallons can do just fine with less than 1 CFM, while ponds that are an acre and above will need 3 or more CFM. The primary downside here is, of course, if there is little to no wind, though the higher end wind-powered aeration systems are typically able to function with as little as 2 mph of wind. In most cases, plants alone aren’t enough to provide adequate amounts of oxygen in your pond. Just as with other plants, submerged aquatic plants work by taking in carbon dioxide and giving off oxygen that can then be utilized by your fish and other pond organisms. In addition, they help to soak up and filter excess nutrients, prevent algal overgrowth, and provide shelter and possibly food for your fish. 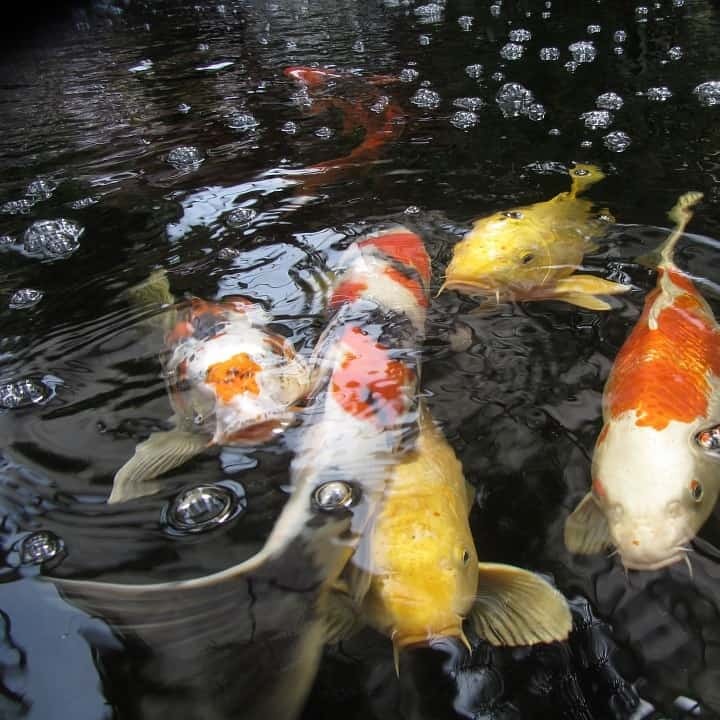 They’re also relatively inexpensive, add to the overall aesthetic and function of your pond, and depending on the species don’t require a ton of upkeep. Some species may need to be cut back from time to time to prevent overgrowth. It’s important to note that, again, you’ll need another oxygen source in addition to plants, as plants actually use oxygen during the night (and particularly cloudy days) for cellular respiration. Also be sure to conduct some research so that you don’t incorporate any invasive species that could cause irreparable damage to the surrounding natural ecosystem.